With the growing number of businesses using social media for their marketing campaigns, how can yours stand out? Read on and discover the arsenals that can help you win at social media marketing. Whether your business is only starting or one that’s been up and running for decades, social media marketing – when done right – can help you significantly expand your market and customer base. Marketing your brand or business in various social media networks and platforms can positively contribute to your acquisition of customers, and eventually, sales. Every success starts with a goal and the foundations that ground them. The same thing is true for social media marketing; you need to understand the social media marketing fundamentals. To get you started on the right foot, here are ten social media marketing laws developed by Susan Gunelius, an author and the CEO of a marketing communications company. • Listening. Before you think of creative campaigns, get to know and listen to your audience first. Figure out their needs, interests, and the things important to them. A campaign no matter how great will be useless if it won’t add value to your audience. • Focus. Focus on what your brand is about and how it can add value to the lives of your target audience. Ground your campaigns with your goals. Don’t attempt to be all things for all people. Refrain from being a jack-of-all-trades. Keep your focus. • Quality. A huge number of followers is nothing if these followers don’t engage with you. Pursue quality relationships with your audience. Engagement is more important than mere numbers of followers. Pursue and work on long-lasting connections. • Patience. Take your time and don’t be too hard on yourself because, as cliché as it may sound, success doesn’t really happen overnight. And as you practice patience, never let your commitment to your business’s success die down and quiver. • Compounding. This law goes with the law of quality. If you commit yourself to sharing quality and valuable content, it will also yield quality and valuable followers in return – aka those who will share, talk about, etc. your content to others as well. • Influence. Finding appropriate influencers to partner with in your social media marketing campaigns can greatly improve your brand’s marketing, leads, traffic, and sales. With the help of influencers, it’ll be easier to reach new and larger audiences. • Value. In sharing your content, products, and services online, try your best not to be too sales-y. If you bombard people with promotions instead of value, you will lose them. Focus more on providing them valuable content. Build lasting connections. • Acknowledgement. Never neglect and be a snob to people who try to reach out through a comment, message, etc. Never forget to acknowledge these people and reply. If you always make them feel noticed, you’ll be able to keep them for good. • Accessibility. Always be present and available to your audience. Making a disappearing act is a big no-no. You must be consistent not only in sharing and publishing valuable content, you must also keep the connection through engagement. • Reciprocity. To be successful in social media marketing, you shouldn’t only talk about yourself and your business. You also need to allot some time to share and talk about the content of others too. In the long run, they’re most likely to the same. In any social media marketing campaign you will do for your business, always go back to the fundamentals and basics. This way, you’re sure to start and finish strong. • Canva. With this nifty visual content tool, anyone – even those without any background in graphic design – can create capturing graphics. This tool’s drag-and-drop function, templates, and other design elements makes graphic design easy. • Hootsuite. If you find it hard to manage your social media accounts, you’ll find Hootsuite extremely helpful. With this tool, you can manage and schedule all your social media posts on all your accounts all in one place. This tool has analytics as well. • CoSchedule. This tool is more than just a tool; it’s a toolset you can use to centralize your entire marketing strategy. CoSchedule offers a plethora of tools for all types of marketing – content, blog management, social media, and a lot more. • Buzzsumo. One way to practice the law of listening as explained above is through utilizing Buzzsumo. With this tool, you can do content discovery, brand monitoring, influencer marketing, content research and curation, competitor research, etc. Social media marketing is an inevitable trend that keep’s on growing. If you don’t join in on the trend, you’ll miss out on the great potential it can bring your business. However, joining in on the trend isn’t enough. You have to win it and stand out amongst your competitors. 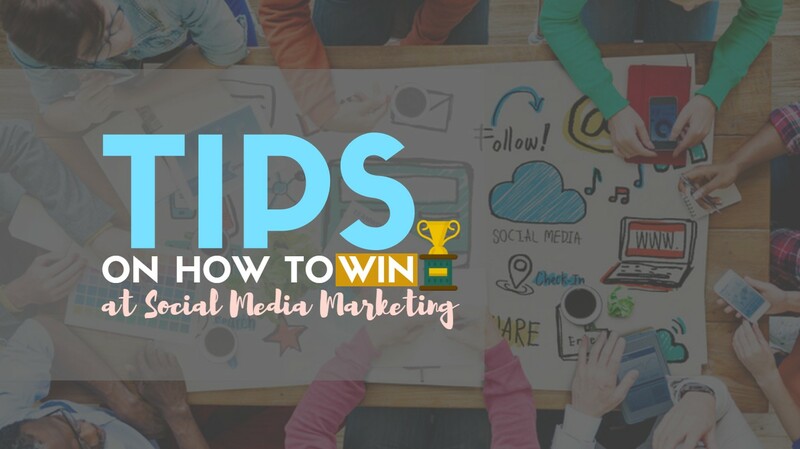 So, give the above tips and tools a try and make your first step in winning at social media marketing.